GCA Altium acted as exclusive financial advisor to the shareholders of PPS. Imaging, a specialist service provider in large-format digital printing, on its sale to NORD Holding. 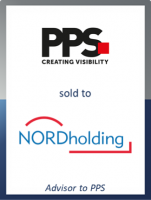 NORD Holding has acquired a majority stake in PPS while the managers Michael Krieger and Roland Niggemeyer co-invested. PPS is a single-source provider for demanding and bespoke large-format digital print solutions, covering the entire value chain from project management, preparation, printing, logistics and assembly. The company covers blue chip clients across various industries including retailers / point-of-sale, automotive OEMs, airports and trade fairs. PPS has seven domestic locations in Hamburg (headquarters), Berlin, Cologne, Bochum, Dresden, Stuttgart and Munich as well as two international branches in Amsterdam and Hungerford (UK). Over the past years, PPS has successfully pursued an add-on platform strategy with four acquisitions since 2013. With more than 300 employees, PPS generated an annual turnover of € 40 million in 2016. NORD Holding will support the further expansion of PPS and strengthen its leading market position. “With NORD Holding we have secured a strong partner who enables us to continue our investments in further acquisitions and strategic projects” said Michael Krieger, CEO of PPS. Terms of the transaction, which was signed and closed in April 2017, were not disclosed.